Pomegranates are high in vitamins C, B5 and K.
As we near the end of the pomegranate season, September through February, it is time to look at this ruby centered fruit. The pomegranate is considered a super food and is one of the most cultivated fruits used for food and juice. According to Greek Mythology, you can thank Persephone and her mother Demeter for the winter months. Hades fell in love with Persephone and kidnapped her. She knew that if she ate anything in Hades she could never leave. After a week of fasting, she saw the beautiful red fruit and ate six seeds. A deal was made that Persephone would marry Hades and became the Queen of the Underworld and live there for six month of the year. The other six months, she would return to earth and live. Demeter, goddess of fertility, grain and agriculture, shows her displeasure when her daughter goes to live with Hades during the winter months by letting everything die. When Persephone returns the world is full of flowers and crops. The Buddhists use it in their art because they see it as a blessed food. To the Egyptians, it was a symbol of fertility. There are some people who believe that the forbidden fruit of the bible was the pomegranate, not the apple. The history of the pomegranate is old. Remains of them have been found in Transcaucasia that date back to 1000 BC and Persia has written records of the fruit in 100 BC. This is one of the few foods mentioned by name in the Bible and Qur’an. The Spanish settlers brought the bright red fruit to California in 1769 and Thomas Jefferson liked them well enough to plant them at Monticello in 1771. The pomegranate tree, which is a shrub that is often very short and used as bonsai trees, can actually grow to be 26 feet tall. Pomegranates come in over 750 varieties. 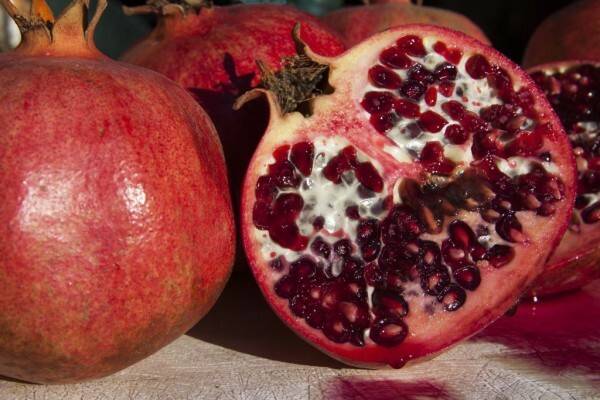 The outside of the pomegranate is red for the most part, but it can also be purple or orange-yellow. The inside is full of deliciously sweet seeds separated by whitish-cream colored membrane that does not taste very good. Studies in Israel have shown that the pomegranate can prevent cancer, keep arteries from hardening and has anti-aging properties. Pomegranates have 83 calories and are high in vitamins C, B5 and K. They also are high in calcium, potassium and manganese. For more tips about living a balanced life, or Nadhirrah visit Summer Bear at www.summerbear.org. No need to worry if you can’t find pomegranates to eat right this minute. There are companies that juice them and sell them year round. *One thing to remember when eating or cutting a pomegranate is that the juice will stain anything.